It was 34 degrees when Wendell Ford & I left camp Sunday morning shortly after 5. Ron Meek, who made the trip with me, & his guide left at the same time. We drove to within a few hundred yards of the area we were going to hunt & sat in the truck until just before daybreak, then started walking & listening as the birds weren’t following the same patterns as in prior scouting trips. We heard a few real distant gobbles but decided to set-up on the back side of where we had been Saturday morning, hoping that Turkzilla would pass by or be attracted to some light calling on the Travel Call I sponsored. About ½ hour after setting up, we had a hen responding from around the far corner of the oak hammock as well as hearing a gobble. She walked within 40 yards of me & stood there yelping, trying to find the long lost sister she heard. A few minutes later 3 more hens came out but stayed at 70+ yards & didn’t follow the 1st hen. Too bad because Turkzilla was following behind then, strutting & gobbling. They kept going & never came within range, disappearing into the palmettos. We stayed put for 15 minutes or so to give them time to get far enough away so we could move without being busted. Then made plans to try & get around in front of them. We took off around the woods heading to where we figured the birds were going. We contemplated a couple of different set-ups but decided against them for 1 reason or another. We did actually set-up twice but only for a few minutes before finding the “perfect” spot. Now, a couple of things all y’all need to understand. Wendell prolly weighs a buck 50 soaking where with small feet. He moves through the woods like a cat, silent but deadly. Me on the other hand, weigh in at about 260 with size 12 feet & move through the woods more like a bull in a china shop. (Not really that bad but a good analogy. LOL) He was slipping through places & putting his feet between twigs that this big ole boy could only dream about doing. Every once in awhile, he would turn around & give me a dirty look or hiss “BE QUIET! !” Well, we finally got set-up & did some calling. Wendell is set up maybe 20-30 yards to my right & slightly behind me so he has a totally different vantage point. I sat there slowly turning my head from left to right, scanning for a red, white, or blue head. When I looked back at Wendell, he was covertly pointing frantically out in front of me. I looked & here came a redhead at 100 yards or so. When he stepped behind some of the tall grass, I got the 11-87 up & into position. He got within 60 yards & the trigger finger started to twitch!! More twitching at 50, even more at 40. I heard Wendell whispering: “TAKE HIM!! TAKE HIM! !” What he didn’t realize was that the bird had stopped where I couldn’t see his head because of the oak branch hanging down in front of me. Finally, after what seemed like hours but was only seconds, he took a couple steps, the 11-87 barked, twice, (low hit the 1st time) & another gobbler made his way to the Great Turkey Hunting Grounds at 8:15 A.M. It wasn’t Turkzilla but was a nice 3 year old, 17 pounds 13 ounces, 8” beard, & 1 1/8” curved, dagger sharp spurs. We got back to camp & both did the “Woe is me!” act of how I missed a bird but I don’t think Ron or Jeremy bought it as 1 or both of them went over & looked in the back of Wendell’s truck. Then, it was Wendell’s turn. I asked him how he expected somebody twice his size & with gunboats for feet as compared to his itty, bitty, feet, to get through the tight spots & be as quiet as he was. I went on & on at him. It was pretty funny. Wendell & I have known each other for 9 years & if we weren’t busting on each other, we would think the other one was mad about something. Well, I guess I have dragged this out long enough, hope all y’all weren’t bored with my story. Here’s yer pics!!!! Enjoy. The tree I set up against. My view. You can see the branch that obstructed my view on the right side of the pic. We didn’t cut it off as we didn’t have time to build a blind & figured it would help break-up my form. The bird came out of the woods right next to the oak tree that is bent over on the right side of the pic. 1 1/8” dagger sharp hooks. 10,000 comedians out of work & Ron’s trying to be funny. The trip down was uneventful UNTIL Ron & I got to the Lake Port Grocery at 3:20 Friday afternoon where we were to meet up with Wendell Ford to enter Gator Slough! We went in to get something to drink & a snack & I swear there were banjos playing in the background!! This store is the 1 you always see in your nightmares. 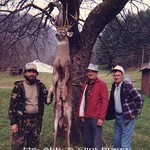 OMG -- Talk about REDNECK! There were Bars on the Doors and Windows that got closed up every night! A truck parked outside with the dash broken totally open to get to the ignition system to start it! The lady running the place had a day bed set-up in one of the isles and I"M SURE SHE HAD A SHOTGUN behind the counter or under the mattress! She did not take kindly to us being in the store, so we got our drinks, returned to my truck, & hid inside, cowering until Wendell got there to save us. To say it was scary would be a HUGE understatement!!!! On the way to Gator Slough, we stopped in Winter Haven & strolled up & down main street taking in & pictures of, all the murals that tell the story of that part of Florida from back-in-the-day. I also got a coyote to close out this hunt. paboxcall wrote: Excellent read, George!